This is a fully inclusive weekend break to hike the Yorkshire Three Peaks for a total cost of £175 per person. The break includes two nights accommodation, all meals plus guiding by professional Mountain Leaders in small groups. We also have a support vehicle for water stops and refreshments at two locations on the route. The Yorkshire Three Peaks Challenge takes on the peaks of Pen-y-ghent, Whernside and Ingleborough, in under 12 hours. These peaks form part of the Pennine range, and encircle the head of the valley of the River Ribble, in the Yorkshire Dales National Park. The Yorkshire Three Peaks route is 24-miles long, and includes 5,200ft (1,585m) of ascent. The Yorkshire Three Peaks challenge is one of the most popular challenges in the UK and can be used as a personal challenge for the pure fun and enjoyment of it, or to raise money for your own chosen charity. It is a difficult challenge and should not be underestimated and you need to be fit to participate. During the day we climb the three highest mountains in Yorkshire and there is significant distance to cover between them. We climb a total of 1,545m and we hike a total of 24 miles and the objective is to complete the route in under 12 hours. We will be setting a schedule with the aim of completing the route in 10.5 hours, so this allows us some contingency for difficulties towards the end of the day. We will start and finish the hike directly from our accomodation which is near the Ribblehead viaduct and we then head up Ingleborough as our first peak. On Sunday, there will be a leisurely breakfast of bacon butties, boiled eggs, fruit juice, tea, coffee, cereals and toast before we head off. For this Yorkshire Three Peaks challenge weekend, we will be based in a lovely recently converted bunk barn of Broadrake right on the main hiking route. Saturday will be a fully guided hike around the Three Peaks route and Sunday a leisurely breakfast before departures at 1030. Meals and accommodation are included from Friday evening until Sunday breakfast. Our accommodation at Broadrake dates back to the 17th century and is a former farm in the Yorkshire Dales National Park lying at the foot of Whernside. Along with other farms and isolated dwellings it is part of the scattered community of Chapel-le-Dale with the nearest village being Ingleton some 4 or 5 miles down the dale. We have sole use of the bunk barn for our group and we have total of 20 places available. The Yorkshire Three Peaks Challenge takes on the peaks of Pen-y-ghent(694m), Whernside (736m) and Ingleborough (723m), in under 12 hours. These peaks form part of the Pennine range, and encircle the head of the valley of the River Ribble, in the Yorkshire Dales National Park. This is actually the original Three Peaks challenge. The Yorkshire Three Peaks route is 24-miles long, and includes 5,200ft (1,585m) of ascent, there is no driving involved between the peaks and the aim is to complete the challenge in under 12 hours so walking in the daylight. This is a fully supported Yorkshire 3 Peaks Challenge with a support vehicle providing tea/coffee/water and where you can store extra food/clothing etc so you do not need to carry everything. We will also have two small groups each with a leader so you can be more closely matched in hiking speed with others, all this means maximising your chances of completing the challenge in 12 hours. Total cost is £175 per person. This includes two nights accommodation, all meals, guiding by professional Mountain Leaders in small groups. We also have a support vehicle for water stops and refreshments at two locations on the route. 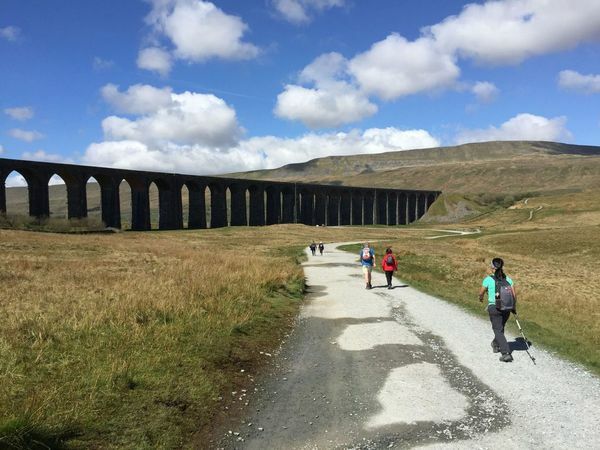 On Sunday, there will be a short local hike around the spectacular Ribblehead viaduct which again will be guided, for those who feel up to it. This is one of the most popular challenges in the UK and can be used as a personal challenge for the pure fun and enjoyment of it, or to raise money for your own chosen charity. At this time of year, we will plenty of daylight, but we will start the challenge at 7:30 am to give ourselves plenty of time to get round. Saturday dinner : a sit down dinner, something filling eg chilli and rice (vegetarian option available) and a desert. For the challenge itself, we will provide things for you to prepare a packed lunch -sandwich/bars/fruit etc. We would recommend bringing some of your own favourite hill snacks and energy bars to supplement this. During the day, water/tea/coffee will be available at each stop on the route. You are free to store your packed lunch and other food in a marked container/bag with your name on it, for use at each stop and of course any other drinks you want to use on the day. (Energy drinks for example!!!) You can also store spare clothes, that you either take off during the day, or you might need as extra layers if the weather changes. Sunday breakfast – a more relaxed breakfast! We also have a limited number of spaces (8) for this as a day event only , so these people will also be joining us on the hike and for dinner. Click here for the day hike option. The day event is an option if you would like to book your own accommodation eg a local bed and breakfast, or would like to camp, or if you live locally and can drive over in the morning without the need for accommodation. In June 2017 we completed the Y3P on one of the worst days of the year. We are proud to say that the whole group completed the challenge in some truly awful weather and you can read about it here. In September 2017 we ran our Y3P weekend break and with much, much, better weather. This is the link to the Blog Page for this break. The Yorkshire Three Peaks takes on the peaks of Pen-y-ghent, Whernside and Ingleborough, in under 12 hours. These peaks form part of the Pennine range, and encircle the head of the valley of the River Ribble, in the Yorkshire Dales National Park. The Yorkshire Three Peaks route is 24-miles long, and includes 5,200ft (1,585m) of ascent. The walk is a very attractive and fun day out. Yes it is really!! The hills are all different in character and offer great views of the other mountains and valleys below. The hiking between each mountain is also full of interest, including picturesque Yorkshire villages, farms and the great Ribblehead viaduct. However, it is a difficult challenge and should not be underestimated and you need to be fit to participate. During the day we climb the three highest mountains in Yorkshire and there is significant distance to cover between them. The hike is mainly on good paths throughout, although there are some rocky sections at the tops of some of the mountains. There is one small section of easy scrambling near the summit of Pen-y-Ghent. We will in effect break the walk into three sections, with a support vehicle about 1/3 of the way at Horton and then at a further 1/3 at Ribblehead before the final climb up Whernside. Our route will take on the peaks in this order : Ingleborough (2nd highest), then Pen-Y-Ghent (the smallest but steepest of the three) and then finally Whernside (the highest, but the easiest ascent). By taking this route we also avoid all the crowds that leave Horton, the traditional start route early in the morning. The support vehicle (our estate car really!) will be provided for you to store water, snacks, food and spare clothing for pick up, or drop off, on the route. This means you wont need to carry everything for the whole day from the start, which helps to maximise your chance of completing the challenge in the time. It also gives you the option of dropping out and being returned to the start in the unfortunate event of injury or illness. Our group will be staying at the Broadrake Bunkbarn near Chapel-le-dale. This is right on the route after the final descent from Inglebrorough, so we will start and finish from here. We have sole use of the bunkbarn which was only converted a few years ago and so is very up to date inside whilst retaining some of its original features. Originally it was a farm built in the early 1700’s. It has shared accommodation in bunkbed rooms sleeps 18 in 4 rooms and is well maintained, nicely furnished and well equipped. All accommodation for this break will be in shared rooms (all male or all female) with shared showers and toilets. There is also a cosy lounge with sofas and a great dining area. The bunkbarn has a farmhouse kitchen that has everything we need and a dining space for us to have our meals. All bedding and towels are provided. There is a suite of showers and toilets on the ground floor. There is also a large drying room outside for us if needed, and also picnic/garden/bbq area outside if the weather is good. It is the equivalent of a small hostel with extremely good facilities. Wi fi is available but please note that mobile reception in the area is not good. The latest we would recommend you arrive is by 21:30 so that you have time to settle in, make your packed lunch for the next day, and get an early night. Sunday : a more relaxed day!! You can also choose to stay longer in the area ; options are to take a short hike around Ribblehead or explore the Caves at Ingleton. Or there is one twin room available for £225 per person. To book your place, click add to basket and then checkout to pay £50 deposit by paypal. Please note that the deposit is non-refundable. The balance payment of £125 (£175 for the twin room spaces) will be due strictly 8 weeks before the event by bank transfer, and your place is only confirmed once full payment has been received. If we cancel or reschedule the event, refunds will be made. If you need to cancel, a refund will only be made if the place is re-filled. We pre-book and pay for all of the accommodation months in advance, so appreciate prompt payment of the deposit and balance. Accommodation for 2 nights, all meals, Professional Mountain leaders to guide you, small group size, water/tea/coffee at each stop, support vehicle. Our accommodation is near the Ribblehead Viaduct, where there is a railway station, and this is an option to travel to and from Yorkshire by train. Optional train times are given below from London, but these trains can also be picked up from other locations along the route. Please use Trainline, or similar to plan your journey by train. We can offer a free pickup for this suggested trains. If you are driving and would like to car share, or offer a lift, you can post through the Facebook Event Page.